About ABS PlasticWhat is ABS Plastic? Acrylonitrile butadiene styrene (ABS) is a common medium strength / medium cost “thermoplastic polymer” (a plastic material, that becomes pliable or moldable above a specific temperature and solidifies upon cooling.) Its transition temperature, from a hard into a viscous or rubbery state is approximately 105° C / 221° F. It is available in two standard colors; Natural (Tan) or Black and Natural can be colored. Both the Natural and Black ABS resins which Hi-Tech uses are food grade. Why is ABS used so often? ABS is resistant to corrosive chemicals and/or physical impacts. It is easy to machine and has a low melting temperature making it particularly good to use in Extrusion, Injection Molding or 3D Printing. ABS is also relatively inexpensive which makes it desirable in a large number of applications across a wide range of industries. What is ABS used for? There are many applications for ABS. Among the most widely known are keys on a computer keyboard, power-tools and LEGOs. What does Hi-Tech Profiles use ABS for? 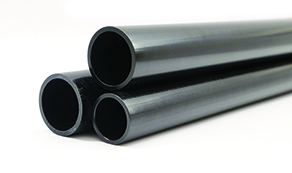 We stock Black ABS Hollow Rod in standard 5’ lengths from ¼” through 2” OD with ID sizes ranging from 1/8” to 1½.” We will also issue custom quotes for tubes and profiles in various other lengths and sizes.